The small featured image above titled Remnant Lake Mungo, 2013, 45×55 cm, part of my series on the Home page titled Begin with Sand, Silt and Water, had a gestation of 22 years, an unusually long time frame. My first trip to Mungo, when I joined a group of friends and camped, was tricky because we set off in December when the temperature reached 40 degrees. By late afternoon it was time, having sheltered in the camping ground, to explore, sketch and take photographs as evening set in and stars emerged. The next day consensus to reach water-filled Menindee lakes meant that exploration at the mysterious and haunting dry Lake Mungo was severely curtailed. A very disappointed artist feeling a little short-changed vowed to return. So I found it difficult to start work, however the result was one oil painting of a sand blown grumpy person standing in front of a night sky. In 2001 a poet friend and I set out in Late September, intending to camp for a week at least. Some things that I noticed about this arrival were the absence of deeply eroded gullies, a relatively smooth terrain and the vast stretch of sky. The country was in the grip of an extremely severe drought so naturally gullies were now buried under layers of sand. Although we took notes, photographs and sketches, harsh conditions and dust storms sent us scurrying for cover. I felt an existential uneasiness caused by a type of desert exposure, the relentless blue sky and reflected heat from sand, compared for example with the embrace of a colourful gorge. 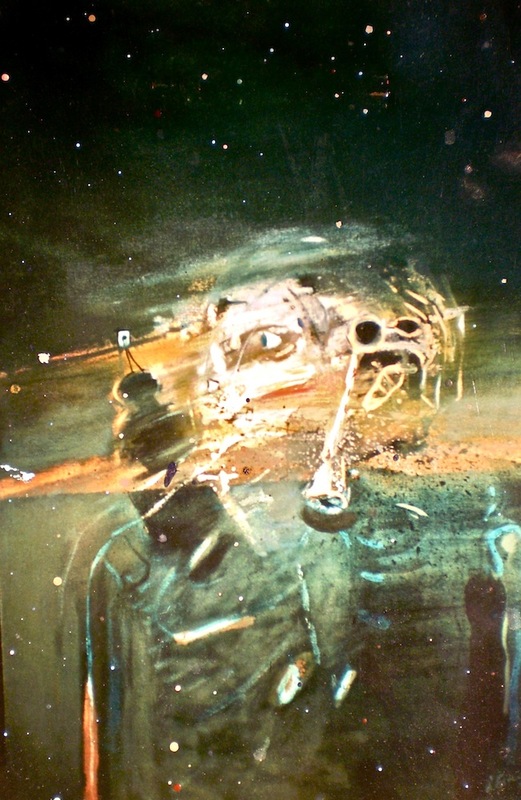 It was as though we were being watched from below which the painting above hints at without my realisation at the time. The sense that there was no relief from this desiccated but beautiful place was unnerving and once again like this site, creativity also dried. It wasn’t until evening that the desert’s multi-coloured sand mirrored the colours in the sky. Until evening, the sun’s relentless bright light faded subtle colour and the pools of our shadows felt as though they could draw us down into the earth. Full stop for me again. 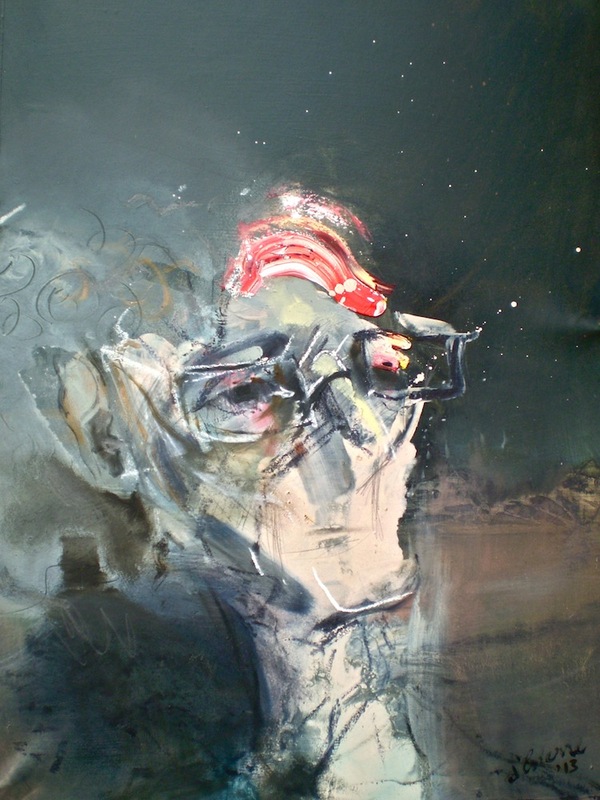 The image above ‘called out’ one day, it became a touchstone so although I wanted to paint a landscape I painted instead a portrait of my fellow traveller and poet, seen below in a painting titled Dust Borne. At that time we were captivated by the vastness of a night sky’s black backdrop throwing into contrast the milky way, visible clearly only in the desert. It was then that I remembered her poem about Mungo. This poem written in 2004 came to my rescue . The excerpt below from the poem titled, ” blandishments and enticements, visuals of electronic speech”, from Modewarre: Home Ground, described ideas and feelings we shared at the Mungo site. can only be viewed through feathered doors 1. Creative juices started up-welling when I read the words “cerulean blue”. In Remnant Lake Mungo, 2013 this cool opaque blue of the sky ‘dome’ visually dissolved the outlines, apart from the dust in the air, of the Walls of China. This name refers to the long rows of dunes that characterise this place. Their colour is a shade of pink caused by leaching from red soil. The Westerly wind-blown particles from the red soil of lunettes at the other side of Lake Mungo blow onto the dunes. In the small painting below depiction of a haunting place has been a long time in coming. 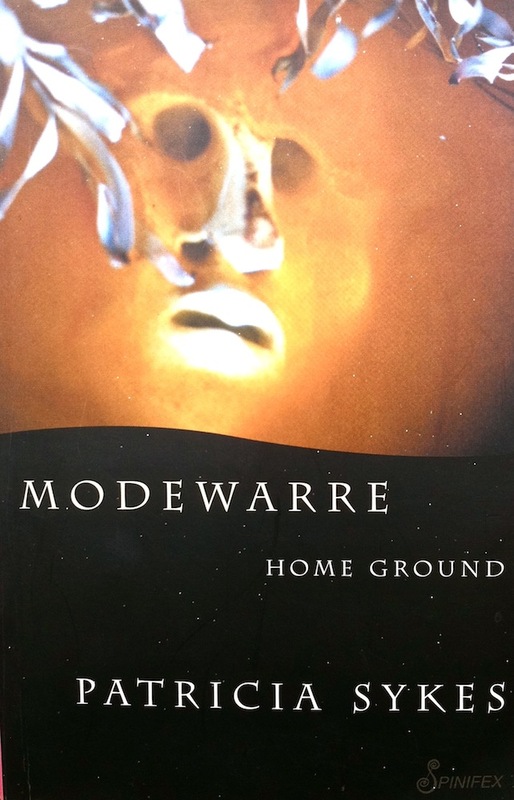 Book of poems by Patricia Sykes titled, Modewarre: Home Ground. 1. Sykes, Patricia. 2004. “blandishments and enticements, visuals of electronic speech.” In Modewarre: Home Ground, pp. 29 – 30. Melbourne: Spinifex. Categories: Mixed Media, Oil Paintings | Tags: journey, Lake Mungo, oil paintings, origin, Patricia Sykes, poetry, poetry books, red earth, sand dunes | Permalink.